Mathieu Wellner: Sixteen years ago you improved the Place Léon Aucoc in Bordeaux by changing nothing. The brief was embellissement [embellishment]—yet you simply called for regular maintenance, and didn’t actually design anything. Why did you make that decision at the time? Jean-Philippe Vassal: We feel it is our duty to start from scratch with each new project. That can also mean fundamentally questioning our own profession—and, with that, the way architecture is practiced. In this case, it seemed quite natural and the right thing to do. MW: And how does the square look now, sixteen years on? Anne Lacaton: The square hasn’t changed much except for a children’s play area which has been installed. But our principle of not changing the form and not replacing the paving has remained. As an architect, you are often asked to change things because what already exists no longer seems fit for purpose. In Bordeaux, however, only a few minor changes were needed because the square already functioned so well. It was, and still is, very important for us to understand that, as a project. It isn’t a refusal—it’s a project involving a conscious decision to do nothing. MW: That continues to be your approach, your design method. You start with talks and discussions instead of drawings or models. JPV: We’re always very curious about what we are going to find. We think that there is a lot of potential in what already exists. Every existing situation has its own special quality, and you have to take your time and be curious in order to understand it. The phase of observing and talking to local residents is very important to us. Only then do we consider what could be done. I think it’s very important today to take the existing situation as a starting point—this includes existing buildings and the existing atmosphere. MW: Whether the project is a conversion or newly constructed, you begin by looking at what is already there. Even if what’s there are “only” trees, as in the case of the house at Cap Ferret. JPV: As an architect, you explore the concept of building. Building can be seen in very material and systematic terms because you build with bricks, concrete, steel, and windows. But in our view, building means first and foremost thinking. AL: Creating a new situation. JPV: Constructing an atmosphere through new moods that we add, but also through using the atmospheres that are already there. That might be the quality of the sunshine, the air, the views, or perhaps the trees, the landscape, and the people?we find there. What is the social situation? These?are all elements of the existing situation that have?to be considered. We only add new materials in?the second phase. But we also take note of invisible material such as smell, atmosphere, warmth, air currents. That is the level at which we see architecture unfold. AL: We are much more interested in the principle of addition than in simply replacing what is there with something new. It isn’t a question of “one or the other” but a question of “one and the other.” That’s why what already exists, and what we find in place, no matter what its components may be, is always an enrichment. That is much more important to us than simply building a form. MW: The refurbishment of the Palais de Tokyo in Paris involved a highly unusual existing architecture:?a monumental 1937 building freighted with ideology— and one that had been standing empty for several years. You started the refurbishment in 1999 and ever since, there has been a sense of temporary usage— as though your work is intended to be provisional. The light touch of your interventions contrasts with the monumentality of the building. Your remodeling never romanticizes, exalts, or reinforces the monumental aspect of the building, but seems almost irreverent: in the initial phase, you created a provisional atmosphere with unfinished partition walls, a caravan as a ticket office, and a hoarding as the wall of the bookshop. 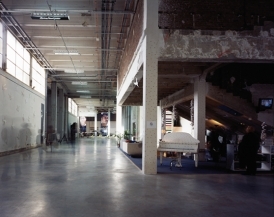 Only recently did you complete the extension of the Palais de Tokyo, more than doubling the exhibition space. So did you reinforce, remodel, and reshape your own temporary solution? AL: It was more incremental. JPV: The initial task involved a program of approximately 5,000 square meters, and in the end we were working with 8,000 square meters. The second phase of the refurbishment project started ten years after the first, with plans for 12,000 square meters, which ended up becoming 16,000 square meters. So all in all we refurbished 24,000 square meters of the Palais de Tokyo. Only minor changes were made to the first refurbishment. MW: This project is quite literally a continuity in building, in the sense that no definitive goal was set?for completion, but part of the building was in use for?a few years and then, after what might be described?as a probationary period, a decision was made on how to approach the rest of it. That is very unusual for a public building of this size, especially in such a location. JPV: That was what was so interesting about the project right from the start. We demolished nothing, damaged nothing. The building had been almost completely gutted ten years before to convert it into the Palais du Cinéma. AL: There are thick columns, slender columns, round columns—we left everything just as we found it. JPV: In the case of this project, the word?“reduce” immediately springs to mind. We aimed?to be as efficient as possible by minimizing work and maximizing economy. The remainder of a column?that had survived the demolition was left unchanged. ?In places where the marble was no longer stable,?but where there was still enough of it left, we installed?a jacket ring or concrete reinforcement to secure it structurally. In other places, where there were concerns about fire safety due to the disintegration of the marble, we made the necessary technical improvements. These were minimal interventions, which we applied accordingly to each individual support or beam as required. ?This was no classic refurbishment project. It followed the logic of a squat—a squatter seeking shelter in?a 10,000-square-meter factory building does not start wondering how to renovate the entire area. That squatter is looking for a place to bed down and feel safe. Over time, he or she might extend that space?and maybe end up occupying 100 square meters. ?Then another squatter might arrive, and so on. ?In the Palais de Tokyo we took a similarly instinctive approach to the space. We were appalled that such?a building could be left empty in the heart of Paris. ?And just because you only start work on one aspect doesn’t mean that you aren’t giving any thought to how things might pan out in the future. When we installed the first freight elevator, we were thinking of how they could be used for the floors that were not yet in use. ?We were very thankful for that later. AL: When we were working on the load-bearing structure of the building, we also stabilized its overall structure, so that was already done. In other words, the second phase had already been started during the first phase. Perhaps it was actually a stroke of good luck that the state didn’t have enough money for a complete refurbishment. That’s why it was decided that there should be a “temporary” project in the first place, simply to stop the decay. ?Now we have completed the project. All the glass roofing has been renewed as well, although that?was not originally envisaged. But we felt it was more important to renew the roof than to spend money?on plastering the walls. The building is now in good order again. MW: You created additional openings and entrances in the outer, symmetrical mass of the building—a subtle gesture countering the dominant monumental entrances of the original building. JPV: We altered the main entrance with its seven- meter-high gate to comply with safety and fire regulations, and installed ramps to allow easy access even with rollerblades. We have left the entrance gateway as it is, while at the same time showing how today’s architecture and today’s expectations of a building have changed. You can work with a building from the 1930s, but you have to bring it up to today’s standards. AL: We wanted to ensure maximum capacity. There are columns, but there are no walls that couldn’t be removed. Our experience of the first phase, however, showed us that it takes a constant effort to maintain this potential for freedom. Over the past ten years, we’ve observed how everything has become more closed in everyday use—so we re-opened it all. Probably it will start to close up again, gradually. If you’ve been changing things for six months, you have to be disciplined enough to then strip things back to the beginning in order to create a state of maximum freedom. MW: When you explain your projects, it always sounds so simple, logical, and easy: there’s an?old building like the 1960s apartment block of Bois-le-Prêtre in Paris, which, by the time it had been refurbished in the 1980s, nobody liked anymore. ?The municipal authorities originally wanted to demolish it and build new apartments. But instead of demolishing it, you added balconies and extra rooms on three sides. You have described the added value of this increased space and aesthetic enhancement as a “surplus.”?Now everyone seems to be happy: the people who live there, the neighbors, and the municipal authorities. ?It’s tempting to think that even the building is pleased with the result. How did you make the case for retaining the original building? AL: The decision not to demolish the building had been made before the call for tenders. But even though we were not directly involved in this particular decision, the study we published in our book Plus helped to sway opinion on that. The authorities realized that there could be a different solution. Then a competition was held, and we submitted our design. Our approach was really quite simple. First of all, we took a look at the apartments and asked what was missing. We also felt that people should be able to stay in their homes during the refurbishment. That meant remodeling the apartment block without actually emptying the building. We just wanted to start with the building that was already there, and the people in it, and find out what we would have to add to make it a beautiful place to live. It seems that was what the municipal authorities wanted too, and our proposal meant that they didn’t even have to re-house people during the construction work. MW: For an intervention like that, is it best to have?a building with a poor image? What if, for instance, it was a building by Le Corbusier, such as the Unité d’habitation in Marseille? Could you be just as radical there? The ultra-pragmatic approach would be to do just that, without distinction. What would be the “plus” in that case? JPV: That’s not easy to answer, because the example you’ve given is a special building, and we always have enormous respect for the work of every architect. There can be no question of demolishing the Unité d’habitation. We would certainly have remodeled the Bois-le-Prêtre building differently if it hadn’t already been so radically altered, indeed massacred, in the 1980s. In a feasibility study for a high-rise in the center of Brussels, the Tour Brunfaut, we found a very beautiful iron construction that?gave the building a remarkable feeling of lightness, refinement, and elegance. We felt that was worth preserving. So in that case, we wouldn’t have taken the same approach as we did in the Bois-le-Prêtre project, but would have perhaps remodeled only the interior. AL: That’s right. If we had found the Bois-le-Prêtre in its original state, as designed by Raymond Lopez in 1959, we would have done things differently. It already had balconies, loggias, large windows, and a foyer. ?We would probably have taken an approach similar to the Palais de Tokyo project: minimal changes and technical upgrades to increase the building’s functional quality. But our Bois-le-Prêtre project wasn’t a refurbishment just for the sake of it—it was an attempt to find out what was wrong with the building, which qualities were lacking, and what could be added. ?The building had fantastic views, but in the 1980s?small windows had been installed. Simply reinstating the panoramic views alone restored a certain special quality to the apartments. Take Le Corbusier’s Unité in Marseille—the apartments are already of a high quality. Another interesting example would be the buildings by Fernand Pouillon in Boulogne. If you were commissioned to change something, there would really be nothing to do except perhaps improve the windows or other such things. The architect has already created a project of quality. We have to consider each situation on its own merits. MW: There is a German word that might be used to describe the kind of ruinous refurbishment that was done in the 1980s to the Bois-le-Prêtre building: kaputtsanieren. Are you familiar with the term? JPV: It’s easy to imagine what it means. Many of the redevelopment programs that have been undertaken in France in the past ten years have involved demolishing 1960s and 1970s apartment blocks and housing rows, especially those that underwent that kind of hatchet job in the 1980s—or kaputtsanieren as you call it. What this also means, however, is that those buildings which were not refurbished actually have better survival chances, as it were, than those that were refurbished to death. AL: At the time, some of the issues under discussion were similar to today’s issues: how to save energy, for instance. Then as now, it was seen as a technical problem that could be solved simply by installing insulation. The only difference is that today, we install twenty-centimeter-thick insulation instead of just ten-centimeter-thick. 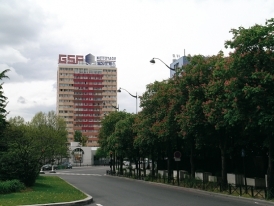 Twenty years on, as we can see in the case of the Bois-le-Prêtre apartment building, it is clear that this is not the solution. I can’t help wondering why we are repeating the same mistakes all over again. MW: You wrote your Plus study in response to seeing one building after another being demolished. JPV: Basic common sense is needed in thinking about what sustainable development, ecology, and economy actually mean. The apartments in the Bois-le-Prêtre project are now some fifty percent bigger than contemporary new builds, and cost half as much. If you destroy a building only to replace it with the same thing, then nothing is gained. You can see how effective it is to develop an alternative to demolition and new construction. At the same time, in terms of sustainability, it is interesting to note that existing stock can be refurbished in a sustainable?way instead of constructing a sustainable new building. The apartments that have been built in France in the past thirty years are too small, too stingy, too lacking in atmosphere. But if you want to tackle the economic and ecological questions of truly sustainable development, you can go a lot further. When we look at the Bois-le-Prêtre apartment building today, every apartment is like a villa with spacious rooms, lovely views, and a garden—a private garden in the middle of the city. The “plus” here is actually a combination of several benefits: the energy problem is solved by the buffer zone of the extension, while providing added freedom at the same time. AL: That is beneficial not only in terms of energy, but above all, it is a vast improvement for the people who live there. Instead of living behind a wall, they?can open up the sliding door to extend their living space into the outdoor area. It is incredible how much that affects the atmosphere and quality of the place. You can achieve the same things through refurbishment that you can with a new building. There is no reason not to provide something like this. JPV: For the most part, we build skeleton constructions with only beams, supports, and floors. That allows for a minimum of fixed walls where they are necessary as reinforcement. We avoid building walls wherever possible. Openings create 100 percent transparent spaces. It is always about inside and outside, even on the fifteenth floor, where we achieve that with patios or balconies. 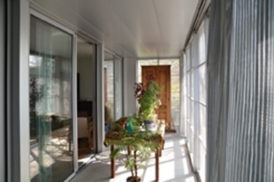 And the simplest and most functional way of dividing inside and outside is a large glass sliding door. That is always our basic concept: a skeleton construction without partition walls, and with large sliding windows or doors that connect the inside and the outside. I think people manage very well with that. There is no need to do more. AL: To return to the Plus study that we did with Frédéric Druot: it all began with the French state launching a major urban redevelopment program that involved mass demolition on a grand scale. It was very radical, and the arguments behind it were mainly economical, based on the notion that these buildings were not worth renovating because that would be more expensive than demolishing and replacing them. AL: It is, but it’s a conception that is completely misguided. The figures that were used to prove?it put the cost of demolition and replacement at somewhere between 150,000–180,000 euros per apartment. That seemed completely over the top to us. So for our Plus study, we felt it was important to do our research very carefully, and to look at the quality-of-living factor as well as the technical aspects. We used specific case studies to demonstrate that the structure of the existing stock is often perfectly adequate if the fittings and technical services are replaced—something that is really not so unusual after forty or fifty years. We found that an apartment can easily be upgraded for around 50,000–60,000 euros. In Paris that figure was a little higher, but still economically viable: for the demolition and replacement of the Bois-le-Prêtre, the municipal authorities had estimated twenty million euros. In the end, our refurbishment cost only 11.5 million euros. JPV: And all without losing a single apartment! AL: If you had demolished the building and replaced it, there would have been thirty percent fewer apartments, because the building regulations on ceiling heights have been changed in Paris. MW: The apartment block is like a built manifesto of your architectural ideas. AL: Yes. But, unfortunately, that doesn’t mean there will be a repeat. In France, they like to award prizes just to say that everything is fine and that you’ve done everything right. MW: So it all ends with the prize? AL: Yes. Everybody likes it, but that doesn’t mean everybody can be bothered to think about its implications. JPV: We often compare the apartment block with the house in Cap Ferret, where we retained all the trees and built the house among them. If we had felled just one single tree, it would have been cheating a little. It was important to be consistent right to the end. ?The same applies to high-rise apartment blocks and housing rows. We know that if you give it enough thought, if you examine the situation closely, if you understand it fully and then act in a way that is consistent—that is to say, if you work with the existing material, you can create a truly beautiful city. 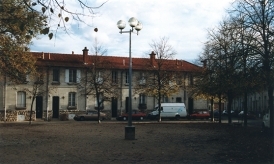 Place Léon Aucoc, Bordeaux, 1996. Lacaton & Vassal suggested not to redesign the square but to preserve it and invest the reconstruction funds in maintenance measures. House in Cap Ferret, 1998. The house was erected as a skeleton construction. The row of trees was completely preserved. 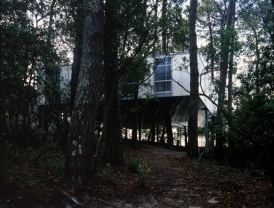 The house is on stilts and thus “hovers” above the ground; the tree trunks are enclosed and become part of the interior of the house. 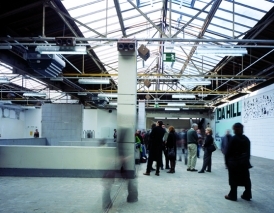 Palais de Tokyo, Paris, 1999–2012. In 1999, when Lacaton & Vassal began work on transforming the existing monumental building from the 1930s into a Museum of Contemporary Art, it had already been partly gutted. They preserved this “provisional” state, adding only what was absolutely necessary. Tour Bois-le-Prêtre, Paris, state of the building around 1990, before conversion. The high-rise apartment block built in 1959 by Raymond Lopez was thoroughly refurbished in the 1980s. The façades were insulated and the windows reduced in size. A new layer of glazed loggias was added on three sides of the apartment block: more space and a better view, a “garden” at the heart of the city. 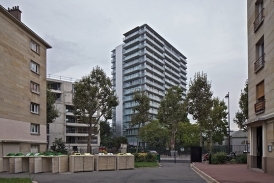 Through the modernization of this residential block, Lacaton & Vassel were able to demonstrate the validity of the theses put forward in their study Plus.